Over the years I have been a huge fan of several bands I felt sure would hit the big-time. Some have and some haven’t. It’s a pretty hard and fast rule that when you love an unknown band and they hit it big some of the lustre immediately wears off. 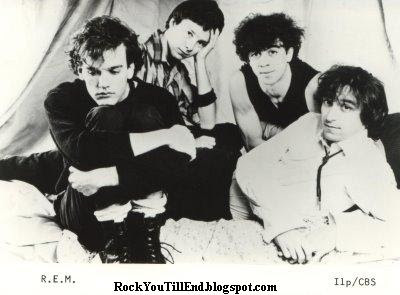 I remember listening to REM back in the early 80’s, and there was something cool about knowing something other music fans didn’t. Then, after the world woke up to them, things changed. I went from watching them along with a couple hundred other fans in a Springfield, Ohio gymnasium to watching them in 20,000 seat arenas. Trust me, there’s nothing more annoying than sitting beside some idiot screaming “SHINY HAPPY PEOPLE!” Sing SHINY HAPPY PEOPLE!” when all you want to hear is some of the early stuff like “Gardening at Night” or “Pretty Persuasion.” Sidenote: REM doesn’t play that song anymore. Thank you Lord/Michael Stipe. I must admit it has given me some satisfaction over the years when a former student has come up to me and said, “Hell, I remember you playing Mudhoney and Soundgarden in class w-a-y before we knew what grunge was all about” or “How in the world did you get away with playing Frank Zappa music to a bunch of 8th graders?” Hell, I have no idea. In my mind I was just expanding musical and cultural horizons the best I could, so to speak. The Eels – The Eels are so big (especially in Europe) that I don’t think E is starving or anything. It was a slow grind but I think they’re near the top of the music scene in some circles now. They Might Be Giants – Although not widely known, they’ve been too commercially successful to make my list. Still love ’em, especially live. Now let’s get to the artists that, for one reason or another, have not found the pot at the end of the rock rainbow. Rock Rainbow. Wasn’t that a psychedelic band from the late 60’s? And what exactly would be in a pot at the end of a rock rainbow? The mind reels. But again I’m off-point. Apologies all-around. And we’re off. Thank ya kindly in advance for clicking on the links as ya go. Nerf Herder – This band was at the forefront of the Punk-Pop sound that came alive in the early to mid-90’s. Picture a cross between Blink-182 and Weezer. Better yet, think Nerf Herder = Peyton Manning, Blink 182 = Eli Manning, and Weezer = Cooper Manning (Note: I’m awesome). These guys have a clean, catchy, whimsical, hook filled sound combined with some of the most intelligently offbeat lyrics in rock music. Granted, a lot of the stuff is tongue-in-cheek and downright juvenile, but I love it. Give a listen to “New Jersey Girl” and you’ll catch the vibe. For a spot of fun, put on “Sorry“, a true punk/pop gem. Just make sure the headphones are on. Teenage Fanclub – These guys from Scotland have been around since the early 1990’s and have never quite caught on, and I know not why. Their sound will remind you of The Byrds, Tom Petty, The Beach Boys, Big Star, hell, even America. They combine great guitar layered tunes, tight harmonies, and smooth vocals. They’ve been solid for almost 20-years now. Give a listen to “Sparky’s Dream” and see if I’m lyin’. Fury in the Slaughterhouse – Easy there, easy. Don’t let the name fool you. These guys ain’t no punk speed metal outfit. Instead, these German badasses play straight ahead rock (with a good dollop of pop) that will leave you wanting more. Formed back in ’87, the lead singer (Kai Uwe Wingerfelder) has a strong, unique voice that brings a certain panache to any song. Listen to “Milk and Honey” to get the vibe. Hoodoo Gurus – What can I say? My love for the Gurus is well documented. There’s nothing fancy about these Aussies, they’re pretty much straight-up unapologetic rockers. For a treat, download “Like Wow – Wipeout“, a Hoodoo Guru classic. Even better, check out “Death Defying“, and sing along with the chorus. Matthew Sweet – When Mathew Sweet released “Girlfriend” in 1990 it was hailed by critics as a masterpiece and Sweet was annointed the NEXT BIG THING. He never quite rose above that great album, at least in the critic’s minds, although I’ve stuck with him through all the ups and downs. Listen to 1993’s “The Ugly Truth” or 1995’s “We’re the Same” for some vintage Sweet. By the way, he’s ungodly good live in concert. Carbon Leaf – Carbon Leaf is a band that I first heard down in The Outer Banks, and I’ve since fell in love with their sound. At first I thought they were some Celtic based band from Scotland or Ireland (where the hell is Celtic music based anyway?) but it turns out they hail from none other than Richmond, Virginia. Who knew? Anyway, you must listen to the music to get what I mean. Give “What About Everything?” a go and let me know what you think. Note: Lead singer Barry Privett decribes their sound as “Porch Music”. The Alarm – These guys are sort of a poor man’s U2 I guess, although I’d put that the other way around (blasphemy!). They emerged as an 80’s alt group and, although they can be a tad pretentious (I told you they were U2ish) they have a great sound. A lot of their stuff is political and rock anthem oriented which is fine by me. Listen to “68 Guns” and “Spirit of ’76” to get the feel. Sidenote: Saw these guys open for Mr. Bob Dylan in 1989. Unforgettable. Steve Forbert – In my mind this cool cat should be ranked right up there Petty and Mellencamp. John Hiatt – Maybe the most underappreciated rockers of our time. He’s in Cincy in October and I shall attend. Todd Rundgren – Pretty well-known, but for the life of me I can’t figure out why he’s not a household name. A true genius. So there you go. I’m sure you all have some faves that you think of in the same way. Great suggestions Shoe. You’ve never led me astray yet. Wow! An eclectic list, methinks, along with the thought that I’ll likely like the list even more as I one at a time over the remainder of the day, hopefully, click on each of your provided links. And not what I expected. I thought I’d see a list of one-hit-wonder bands, as they could have somewhat been related to your topic.